There’s a whole cup of black sesame seeds in this gelato, which, aside from being delicious, is terrific for your hair. You toast the sesame seeds, then grind them to a fine powder. There’s also a spoonful of peanut powder, which is just finely ground peanuts, to enhance the sesame flavor. You can find peanut powder in Asian grocery stores or look for peanut butter powder in American grocery stores. I also discovered that whipping the cream makes home-churned ice cream and gelato freeze better because it aerates the ice cream like industrial ice cream machines do. It’s the first time I tried this and the texture turned out really well. If you don’t have an ice cream maker, you can also make popsicles! This recipe makes 1 quart plus a small bowl. As always with homemade ice cream and gelato, it’s best straight out of the ice cream maker, so remember to enjoy a bowl before putting the rest in the freezer. Some of the links in this post are affiliate links, which pay me a small commission for my referral at no extra cost to you. Thank you for your generous support! Freeze your ice cream bowl for at least 24 hours. Sometimes I just leave it in the freezer for a week. Grind the black sesame seeds. I prefer a spice/coffee grinder and do it in 3 batches, but you can also use a food processor or powerful blender. Put the ground sesame seeds in a heavy bottomed skillet over medium-low heat and toast, stirring frequently, until you begin to smell a nutty aroma (5-10 minutes). Transfer to a bowl. Blend the whole milk with the peanut butter powder and Thai white rice flour, then pour into a medium pot and add the black sesame powder. Cook over medium-high heat, stirring constantly, until the mixture thickens. Remove from heat and pour through a fine mesh strainer into a large bowl. Use a spoon to scape and press the mixture through the strainer. You should only have a little bit of coarse sesame grounds left in the strainer at the end of this process, no more than a few tablespoons. Stir the salt and sugar into the mixture. Cover the bowl and let the mixture cool, then chill it overnight in the fridge. When you are ready to churn your gelato, whip the heavy cream until soft peaks form. If the weather is hot, it helps to refrigerate the bowl until it's cold before doing this. Fold a little whipped cream into the black sesame paste to loosen it up, then fold in the rest in a few batches. Churn the gelato in your ice cream maker, then eat immediately or freeze it. If you don't have an ice cream maker, you can freeze the mixture in a popsicle mold. Once frozen for longer than 4 hours, let the gelato soften at room temperature for 10 minutes before scooping. Also, I love the background that peanut flour is often added because I’ve always thought the sesame gelato had a hint of PB flavor (which, lest there be any doubt, is completely awesome). This is gorgeous!!! Discovered your site from a link on Mark’s Daily Apple. I rarely make desserts…I’m much more likely to just eat a bit of chocolate. But might have to try this. 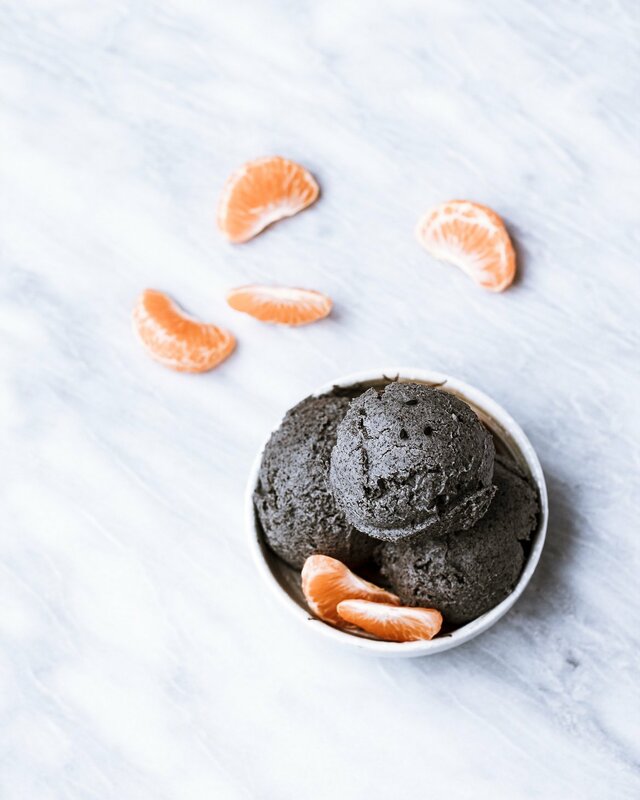 Always heard black sesame was great for your hair…I’m all about foods that help you look great!